Secret document suggested death toll was much higher than later reported, while claiming wounded students were bayoneted as they begged for their lives and the burnt remains of victims were 'hosed down the drains'. The death toll from the 1989 Tiananmen Square massacre was at least 10,000 people, killed by a Chinese army unit whose troops were likened to “primitives”, a secret British diplomatic cable alleged, AzVision.az reports citing the Independent. The newly declassified document, written little more than 24 hours after the massacre, gives a much higher death toll than the most commonly used estimates which only go up to about 3,000. It also provides horrific detail of the massacre, alleging that wounded female students were bayoneted as they begged for their lives, human remains were “hosed down the drains”, and a mother was shot as she tried to go to the aid of her injured three-year-old daughter. Written on 5 June 1989 by Sir Alan Donald, the then-British ambassador to China, the hitherto secret cable has now been placed in the UK National Archives at Kew, where it was found by the news website HK01. The ambassador said his account of the massacre of the night of 3-4 June was based on information from a source who had spoken to a “good friend” in China’s State Council, effectively its ruling cabinet. The State Council member, Sir Alan said, “has previously proved reliable and was careful to separate fact from speculation and rumour”. In unflinching detail, Sir Alan told London that the “atrocities” against thousands of pro-democracy protesters in and around Beijing’s Tiananmen Square had been coordinated by the 27 Army of Shanxi Province, whose troops he described as “60 per cent illiterate and called primitives”. Sir Alan said previous waves of troops had gone in unarmed to disperse the protesters, many of whom were students. Sir Alan added: “Students understood they were given one hour to leave square, but after five minutes APCs attacked. “Students linked arms but were mown down. APCs then ran over the bodies time and time again to make, quote ‘pie’ unquote, and remains collected by bulldozer. Sir Alan’s cable stated that the violent repression of the Tiananmen Square protests occurred after some members of China’s State Council had come to consider that civil war was imminent. Sir Alan reported as speculation that Deng Xiaoping’s Communist government chose the 27 Army for the operation because its troops were “the most reliable and obedient”. He reported that from what he had been told, 27 Army troops had used dum-dum bullets and “snipers shot many civilians on balconies, street sweepers etc for target practice”. “27 Army ordered to spare no one,” he wrote. “Wounded girl students begged for their lives but were bayoneted. The cable also alleges that the massacre continued even after the first wave of killings. Sir Alan wrote: “1,000 survivors were told they could escape but were then mown down by specially prepared MG [machine gun] positions. In another incident, the cable said, the troops even shot one of their own officers. This estimate is way above any figures issued by the Chinese government, which has numbered the civilian dead at between 200 and 300. There has never been an undisputed figure for the death toll, but on early on the morning of 4 June, the Chinese Red Cross estimated that 2,700 people had been killed. This is still way below the figure suggested by Sir Alan, but most reports of the massacre now go with the Red Cross number or something close to it. In 2014, however, it was reported that a confidential US government file quoted a Chinese military source as saying the Communist regime’s own internal assessment believed 10,454 people had been killed – a figure that would fit Sir Alan’s initial estimate. 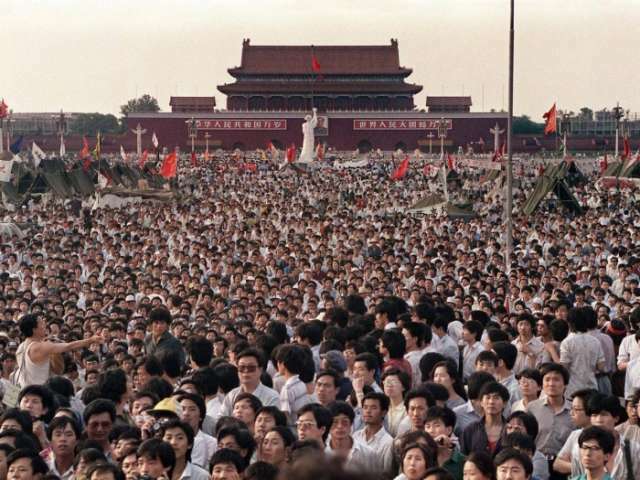 The Chinese government has always characterised the response to the Tiananmen Square protests as legitimate defence against a counter-revolutionary riot or rebellion. On the night of 3 June, United Press International reported that a statement was repeatedly broadcast on Chinese television, claiming: “Tonight a serious counter-revolutionary rebellion took place. Thugs frenziedly attacked People’s Liberation Army troops, seizing weapons, erecting barricades, beating soldiers and officers in an attempt to overthrow the government of the People’s Republic of China. “For many days, the People’s Liberation Army has exercised restraint and now must resolutely counteract the rebellion.